In 1988, Donald Trump had a meeting with Mikhail Gorbachev. The problem was that, well, he actually didn't. The President-elect’s praise of Putin has sparked concern from security officials as well as a considerable number of memes featuring the two politicians enjoying a shirtless horseback ride together. But would “The Donald” even recognize Putin if the men came face to face? Because the last time he tried to meet with a Russian leader, Donald Trump was duped. Soviet President Mikhail Gorbachev in Moscow, 25 December 1991. It was 1988 and New York City was buzzing with the arrival of the then-Soviet leader, Mikhail Gorbachev. Soviet flags, impassioned protests, and police barricades had sprung up along the route that the blocks-long motorcade took to the Soviet Mission’s American headquarters on East 67th Street. Gorbachev was scheduled to address the United Nations General Assembly, meet with President Reagan and President-elect Bush, and — according to some outlets — take a tour of Trump Tower. This was later speculated to be a classic Trump lie. Since there is no concrete evidence that a visit to Trump Tower was ever even tentatively considered by Gorbachev — one member of his delegation telling The Washington Post, “I think that’s a misunderstanding. I don’t think that was on the program.” — Trump was likely surprised to hear that the charismatic politician had arrived at his doorstep. The New York Times reported that at around 2 p.m. on December 6, Trump “rushed” down from his office and onto the street where the famously unpredictable Gorbachev was rumored to be greeting random shoppers. “Mr. 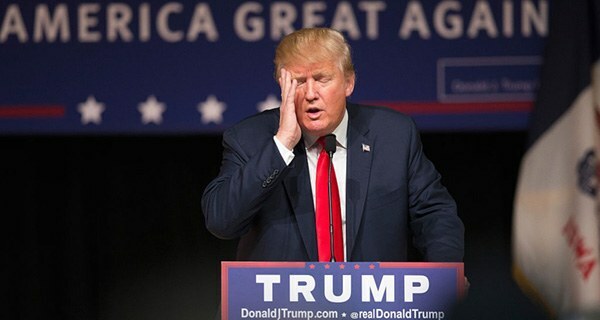 Trump and his bodyguards wedged their way through the crowd and shook hands with the man who was a dead ringer for Mr. Gorbachev – right down to the distinctive mark on his scalp,” the article said. But for all the similarities, the man surrounded by hundreds of curious passerby was actually actor Ronald V. Knapp — whose impersonation stunt was being filmed by a crew from Channel 5. “Great great honor,” the future leader of the free world can be heard saying in the footage. 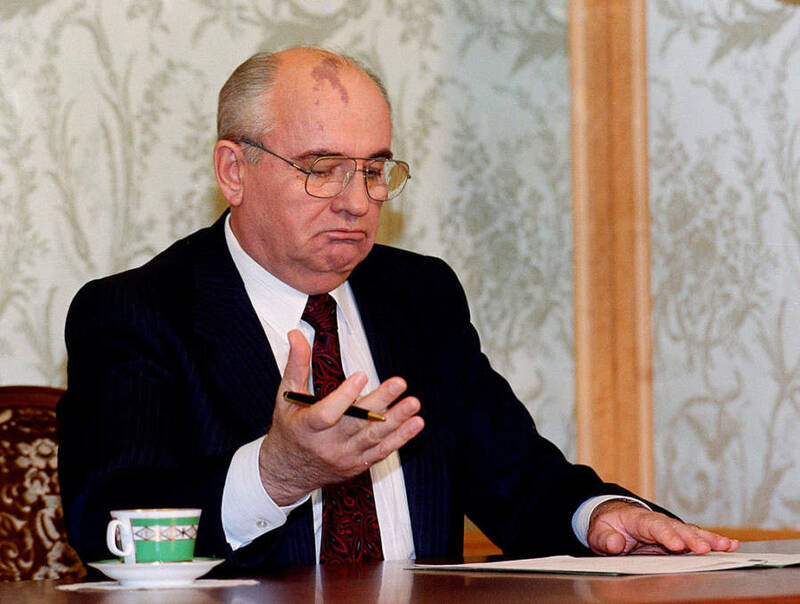 “I like your tie,” not-Gorbachev replies. Upon learning that the true identity of the person with whom he had exchanged a handshake and pleasantries, Trump insisted that he had known the whole time the man was a fake. In spite of Trump’s claimed deductive reasoning skills, though, he shows no signs of suspicion in the footage and Gordon Elliot — a TV host who had been present for the encounter — insisted Trump’s enthusiasm had been real. “There was absolutely no question that he bought it,” Elliot said. Almost 40 years later, Trump is still having issues with how his ties to Russia are interpreted in the media. After a campaign largely defined by what came to be known as the Republican’s “Russia Problem,” the real Mikhail Gorbachev is among those surprised by Trump’s win. 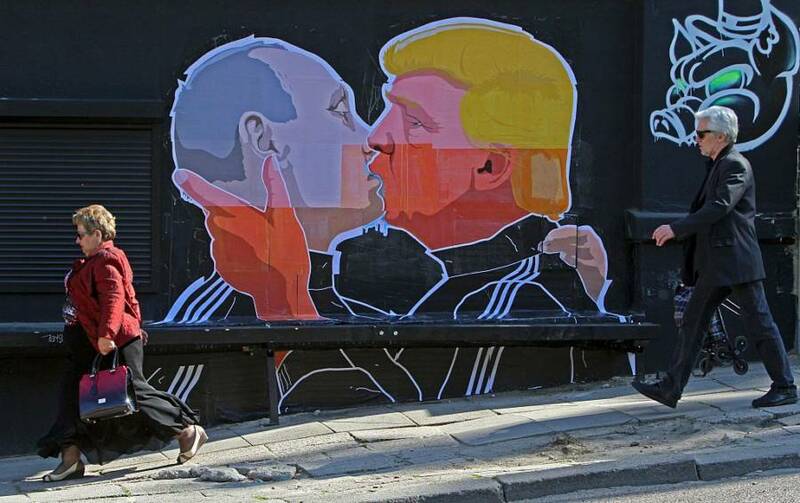 People walk past a mural on a restaurant wall depicting Donald Trump and Russian President Vladimir Putin greeting each other with a kiss. 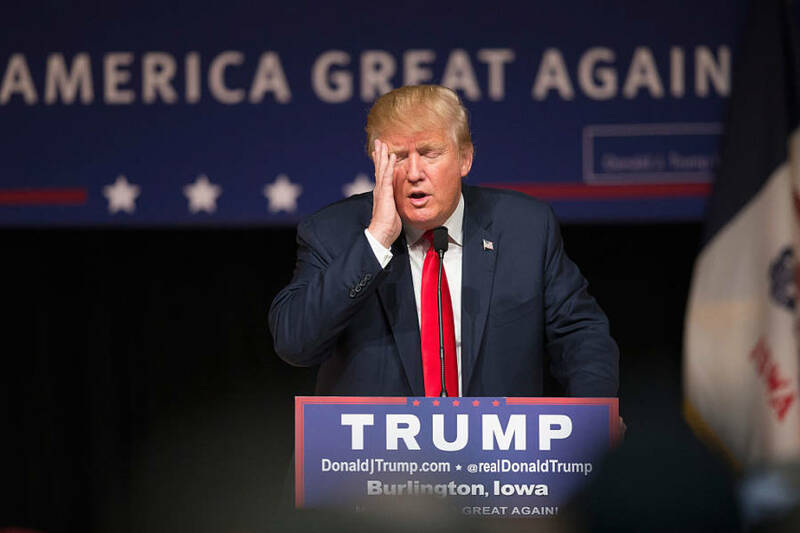 For more, check out these Donald Trump quotes that you’ll have to read to believe. Or take a look at how Russia interfered with the recent presidential election. How War, Gender Stereotypes, And The Economy Gave Birth To "G.I. Joe"